Slide Lock or Slide Stop? Early in my training to become a handgun instructor, I was taught to place a semi-automatic handgun into battery by pinching the rear end of the slide between the thumb and forefinger of my support hand, pulling back on the slide with the support hand while pushing forward on the grip with my shooting hand, then releasing the slide when I felt it stop, which happens in something like an eighth of an inch on most semi-automatics. For a slide that is difficult to pull back, an alternative to pinching the slide with between the thumb and forefinger is to reach across the rear of the slide with the heal of my hand on the left side of the slide and my fingers on the right side (I’m right-handed), squeeze tight and pull the slide back and release it that way. Either of these methods is commonly called the “sling-shot” method by most instructors. To me the terms “sling-shot” and “rack” the slide are synonymous in this context. In studying the issue more carefully, I’ve discovered some other reasons for using the sling-shot method as opposed to thumbing the slide lock. One of these is that this method provides the gun with a stronger, cleaner push into battery, as long as you don’t ride the slide forward with your hand. That’s the important part. Whether you pinch the slide or reach across it with your hand to grasp it, you must let it go as soon as you feel the slide stop in its rearward move. This will happen with very little rearward movement. When you let it go, let it go like it was hot and burning your hands. If you need to reach across the slide to grasp it, avoid the ejection port as this is a place on the gun that can easily pinch you, perhaps even drawing blood. The sling-shot method works on all semi-automatics, pretty much the same. Slide lock levers are all over the place from gun to gun. Some are small, some are large, some are way forward, some are near the rear of the slide, maybe not the notch, but the lever (I’m thinking in particular here of the Sig Sauer SigPro 2022). Maybe you’re left-handed and the slide lock lever is on the side opposite your shooting hand thumb. If you use the sling-shot method, you don’t have to worry about where the slide lock is and if you can get your thumb on it. Strength is sometimes an issue when racking a slide, especially for women or anybody with hand issues such as arthritis or any of the issues that come with long-term and frequent computer use. Using your thumb to release a slide lock can have the same issues. Regardless, I won’t do it with my guns because I want them to last a long time, plus I find it much quicker to just sling-shot the slide. When it comes to racking slides and locking them back for the range safety officers or to load the gun, new gun owners are often confused with the internal slide lock associated with an empty magazine. Practically all semi-automatics are designed such that when a magazine is emptied the follower inside the magazine engages a notch inside the gun that locks the slide back. This is how you know the gun is empty and requires reloading before you can continue shooting. This internal slide lock can frustrate your attempts to sling-shot the slide, because with an empty magazine in the gun, you must also be pushing the slide lock down at the same time you’re racking the slide. 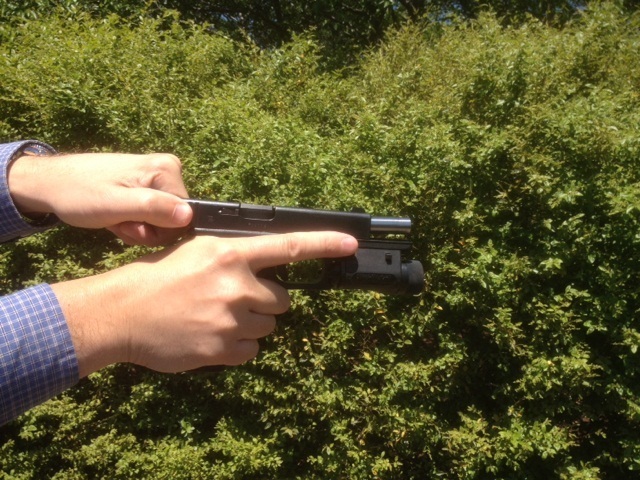 This should be done with the thumb of your shooting hand if you’re holding the gun correctly. Just remember, if the gun has no magazine in it or a magazine with ammunition in it, simply pull the slide back slightly and release it to get the slide to go forward with the proper strength and velocity for it to go into battery. 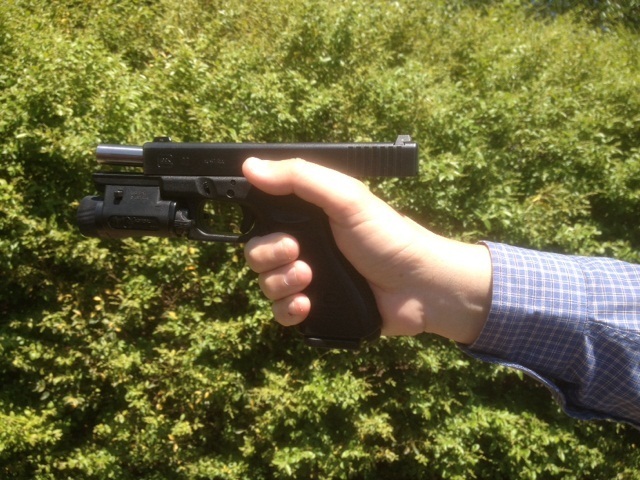 But with an empty magazine, you must also push the slide lock down while rack the slide. Previous Previous post: It’s Not Bragging if You Have the Pictures!